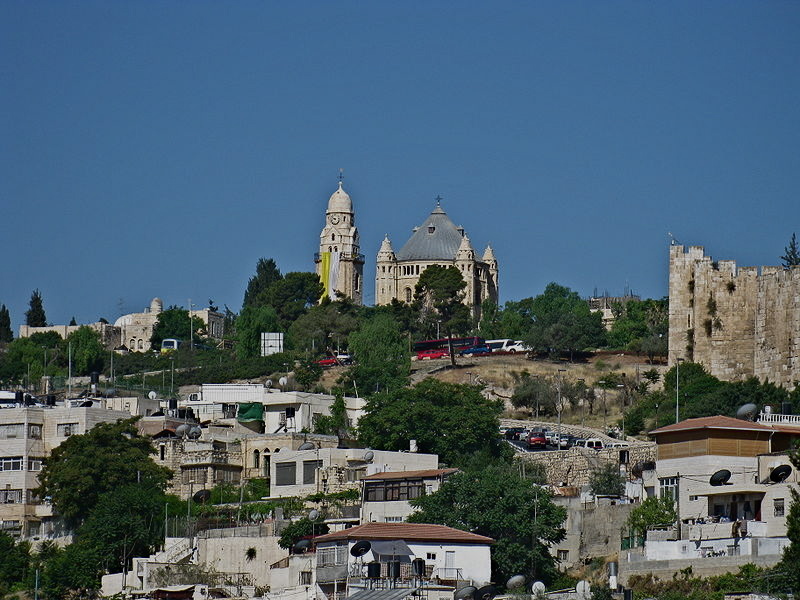 Mount Zion, the highest point in ancient Jerusalem, is the broad hill south of the Old City’s Armenian Quarter. Also called Sion, its name in Old Testament times became projected into a metaphoric symbol for the whole city and the Promised Land. • The “falling asleep” of the Virgin Mary, believed to have occurred at the site of the Church of the Dormition. • The Council of Jerusalem, around AD 50, in which the early Church debated the status of converted gentiles (Acts 15:1-29), perhaps also on the site of the Cenacle. In the Old Testament period, Zion was the eastern fortress that King David captured from the Jebusites and named the City of David (2 Samuel 5:6-9). A psalmist described Mount Zion as God’s “holy mountain, beautiful in elevation . . . the joy of all the earth” (Psalm 48). And again, “Those who trust in the Lord are like Mount Zion, which cannot be moved, but abides forever” (Psalm 125). Ironically, by the time this psalm was composed, the name of Mount Zion had already moved from its original location at the Jebusite fortress — and would move again. First, perhaps at the time Solomon built his Temple, the Temple Mount came to be called Mount Zion. Then in the first century AD, following the Roman destruction of Jerusalem, the name was transferred to its present location across the Tyropoeon Valley. In the time of Christ, Mount Zion was a wealthy neighbourhood, densely populated and enclosed within the city walls. There was also a community of Essenes, a group who lived a strict interpretation of Mosaic Law. They are better known for their community at Qumran, where the Dead Sea Scrolls were discovered. The first-century Christians met on Mount Zion, where they built a Judaeo-Christian synagogue-church that became known as the Church of the Apostles. 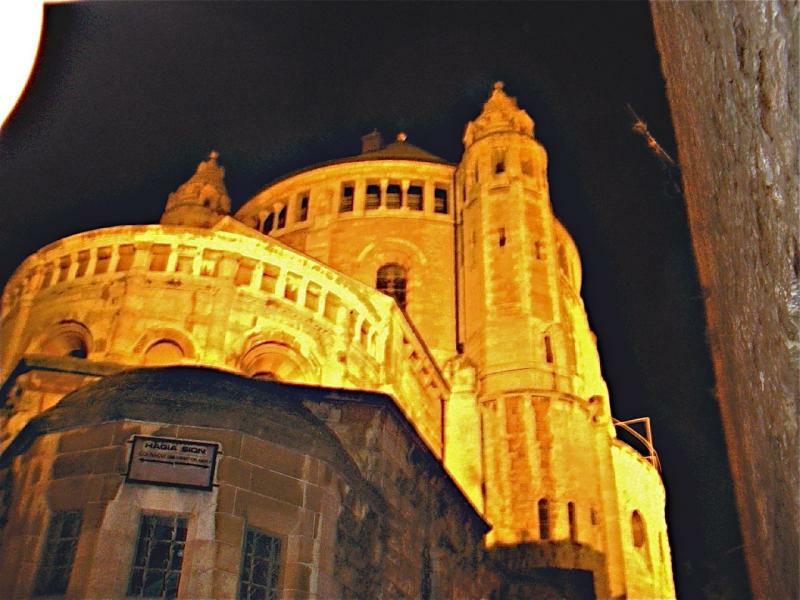 Over the centuries a succession of churches were built on the site and later destroyed. These included the great Byzantine basilica Church of Hagia Sion (Holy Zion), known as the “Mother of all Churches” — which covered the entire area now occupied by the Church of the Dormition, the Cenacle and the Tomb of David. The Old Testament (1 Kings: 2:10) records that King David was buried in the city of David, which was on the original Mount Zion. Because the name of Mount Zion had moved to its present location, as described above, Christian pilgrims in the 10th century developed a belief that David’s burial place was there too. It was actually the Christian Crusaders who built the present memorial on Mount Zion called the Tomb of King David. However, three of the walls of the room where its empty cenotaph stands are apparently from the synagogue-church used by the first-century Judaeo-Christians. The respect with which Muslims held King David is illustrated by a legend relating to the reconstruction of Jerusalem’s walls by the Turkish conqueror Sulieman the Magnificent in the mid-16th century. As the story goes, the sultan was furious when he discovered that the new walls did not encompass Mount Zion, leaving the Tomb of David unprotected. He summoned the two architects responsible for the project and ordered that they be beheaded. Two graves in the inner courtyard of Jaffa Gate are said to be those of the architects. Another place of interest on Mount Zion is the grave of Oskar Schindler, a German industrialist who saved nearly 1200 Jews in the Holocaust and has been declared a Righteous Gentile. The grave is in the Catholic cemetery near Zion Gate.